For me, someone born and raised in Tokyo, the Ginza of my childhood was a special place that we would go to all dressed up on the train. In the winter, I’d put on my red cloak, fox fur muffler, and boots. I’d see a movie or play with my grandmother, look for a book or notebook with my father, or go to a department store to buy gifts with my mother. I’d especially look forward to snack time at one of the famous Japanese sweets cafés. 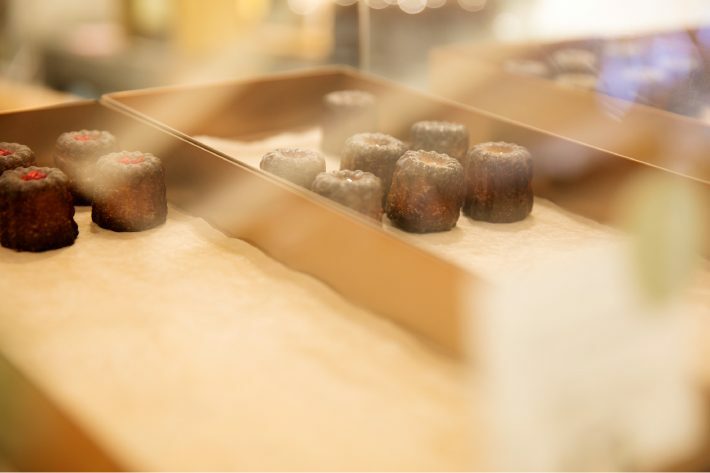 Both distinctive and formal, the abundance of refined food, clothing, and living has been and always will be a part of Ginza. Isn’t this what remains unchanging about its appeal, then and now? I got really involved in fashion and jewelry through my work and began frequenting Ginza. But, for a long time, I’d lost this sense of Ginza’s distinctiveness. Stepping into GINZA SIX, with the very latest in food, clothing and living, from high-end global brands to shops with detail and particularity, the idea of Ginza as a very special place rushes back to me. 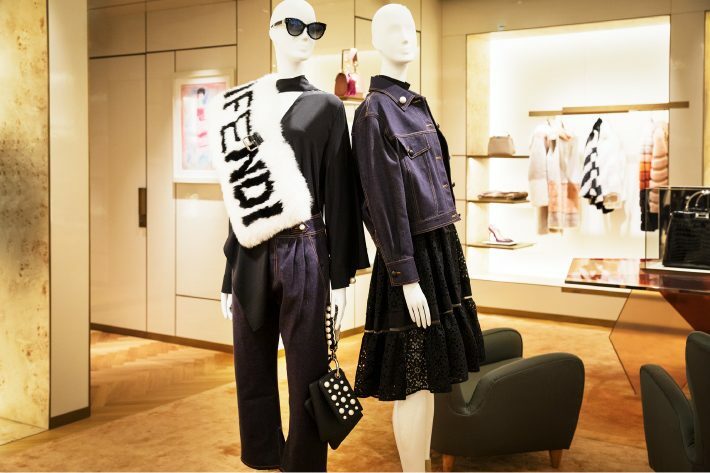 Fendi, a luxury brand from Rome with an over 90-year history, occupies a corner of the first floor of GINZA SIX. The façade resembles the stately Roman Colosseum or the Palazzo della Civilta Italiana, which is home to Fendi’s headquarters. Entering the boutique, you see mannequins adorned with the brand’s new Ribbons & Pearls capsule collection. It’s a double helping of sweet motifs in chic monotone, with art work and other details that draw on artisanal techniques. Every item has the scent of a luxurious adult sweetness. 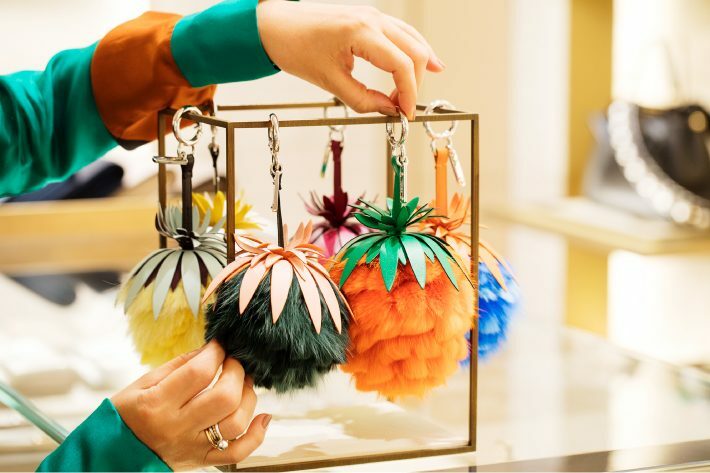 I think what’s wonderful about Fendi is that while it’s created numerous hit products over its proud 90-year history, it always pursues what’s the hottest among the current fashion, driving the latest trends with ever-fresh creativeness. For example, the bag strap boom of recent years started at Fendi. And Fendi launched the fur trend and the vogue in character-shaped charms. The FF logo, which itself brings back fond memories, was used extensively on the runway at the 2018 Spring/Summer Milan Fashion Week. Monograms are a top trend this season. Fendi is no doubt at the center of it all, and my gaze naturally turns to straps and wrappies with the FF logo. The main items on the second floor are shoes and prêt-à-porter clothing. Luxury sneakers maintain their strong momentum while continuing to evolve, while slip-on sandals are set to become popular for spring and summer this year. And there they are—naturally enough, we find Fendi ahead of the curve. The footwear features a pop design with “FEN” on the left and “DI” on the right written in studs. So should you go with sneakers or sandals? What to do, what to do? There’s also Ribbons & Pearls ready-to-wear apparel on the second floor. I find a blouse with black pearls solely on the cuffs. Combined with fur with the logo, it creates a style of tempered sweetness that very much piques my interest. What I’d actually like to recommend at Fendi Ginza is watches. 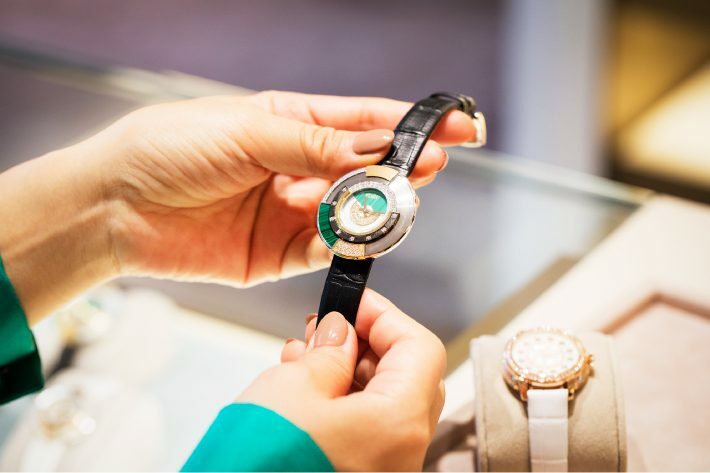 The timepieces are small, so they can be a bit hard to find in this spacious store, which runs from the first belowground floor up to the third floor. You’ll find the relatively affordable models toward the rear of the first floor and the high-end models, with diamonds, on the third floor. A particular favorite of mine is Policromia designed by Delfina Delettrez Fendi, a fourth-generation member of the Fendi family and a renowned jewelry designer with her own brand. Inspired by the streets of Rome, the design is both classical and futuristic, both natural and mechanistic. The splendid harmony of opposing elements makes the watch face instantly unforgettable and vividly attests to Delfina’s talent. In particular, I find myself entirely captivated by a model with mysterious green malachite and diamonds. Malachite, incidentally, is known for its talismanic qualities, so this may point to some evil spirit lurking within I should drive off (laughing). 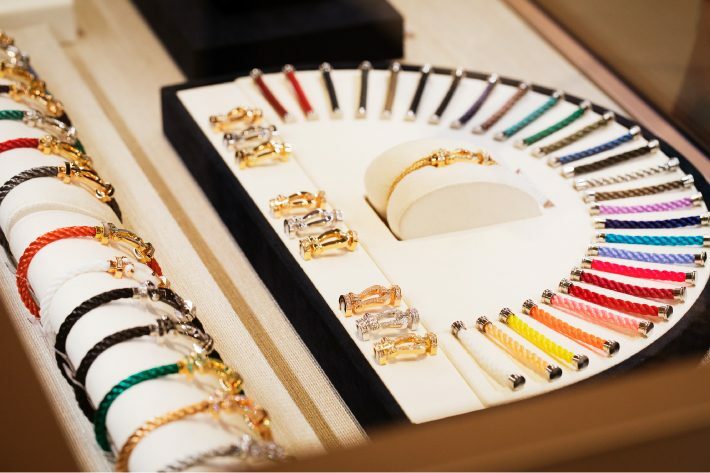 It’s highly conspicuous for a location that’s not a stand-alone store; for an establishment representing a famous jeweler, it’s highly accessible. Now I’m talking about Fred, which I visited after Fendi. 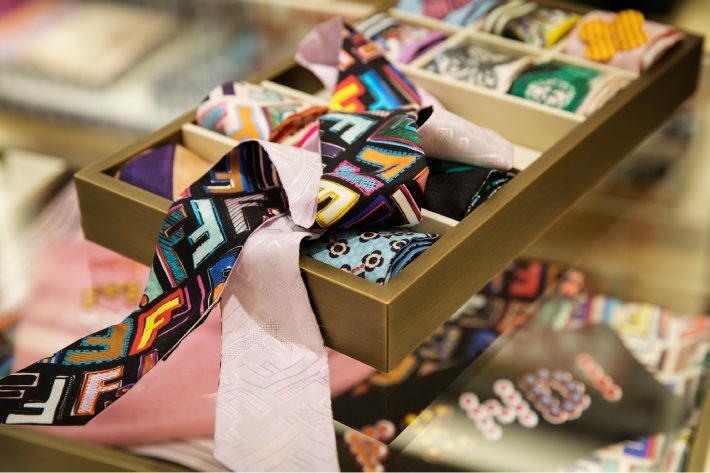 Fred is a boutique that exhibits a strong presence and position, even within GINZA SIX. A restrained interior color scheme of white, pink gold, and navy feels not at all monotonous, partly due to the refreshing visual images that punctuate the center and table areas. Fred is a Parisian jeweler, but its designs are inspired by the French Riviera. I’m told that’s because founder Fred Samuel was born in Argentina and that the memory of that brilliant Argentinian light lives on in the jewelry. Of Fred’s jewelry, the collection I really like is FORCE 10. The bold, invigorating designs incorporate a motif of sailboat shackles and cables, putting in one’s mind thoughts of marine sports, which Fred Samuel himself enjoyed. That’s the inspiration for the centerpiece found in the middle of the store. When you look into the display case, you’ll see a range of options for FORCE 10 bracelets—options for buckle materials, with and without diamonds, and, above all, a surprising variety of options in cable colors. You’re free to mix and match all these options in whatever permutations you can imagine. Another big draw is that you can easily buckle one around your wrist. 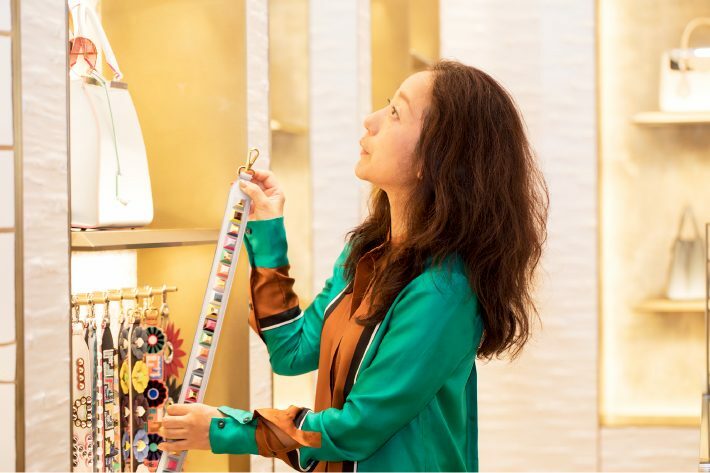 The boutique’s manager, Ms. Kurabayashi, locates a FORCE 10 bracelet for me, one with a new chain of delicate links. She asks if I want to try it on. I do—and, well, it’s wonderful. Remarkably refined, remarkably stylish. The cable and leather types can be worn together, or you could casually wear one over your blouse or knit for a high-fashion look. The FORCE 10 collection also includes engagement and wedding rings you won’t want to miss. The twisted platinum cable designs of the shank are both elegant and unique and generate enough presence to rival a centered one-carat diamond. 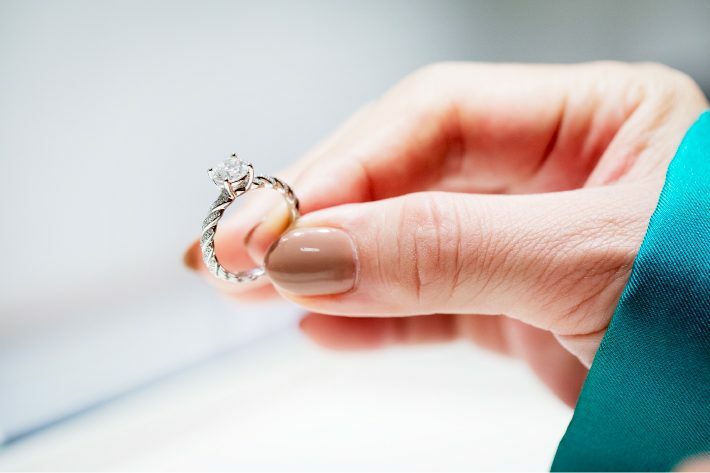 It’s good news that there’s a small bridal section at Fred at GINZA SIX, since you can browse the glistening, top-tier rings without the strain of opening intimidating doors. Toward the rear, you’ll see a display redolent of the resort style, a spectacle to inspire thoughts of your own honeymoon. 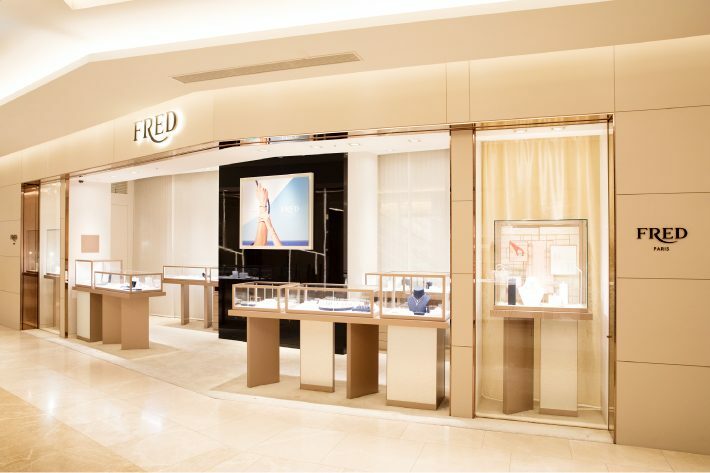 Fred at GINZA SIX is the perfect place for ring-hunting. 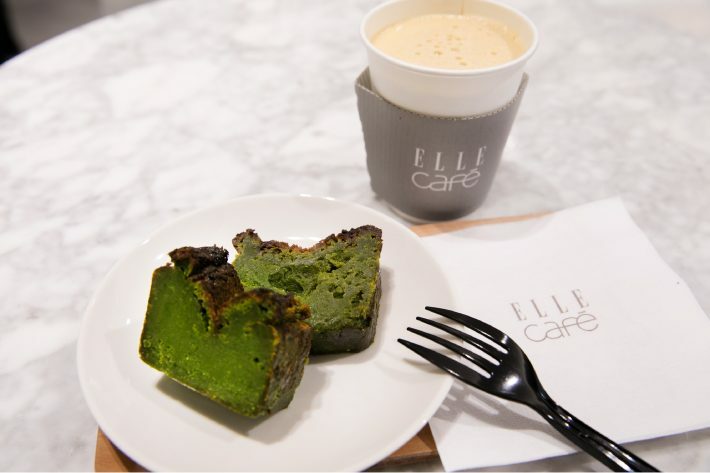 I’m on a gluten-free diet, so when I found ELLE Café on the first underground floor of GINZA SIX, I all but jumped for joy. I always look for this type of restaurant in the districts I roam, and Ginza doesn’t offer that many health food options. So ELLE Café today is my savior. 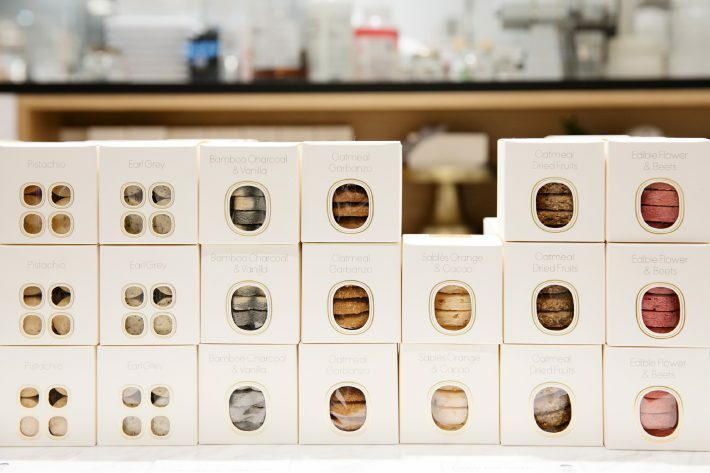 Located in the middle of the cosmetics floor, it’s easy to miss—though, come to think of it, the people who come to GINZA SIX to buy cosmetics tend to be health conscious. I came just in time—it’s early in the afternoon, but the gluten-free canelé is just about sold out. I also buy a box of cookies as a small gift for someone I’m meeting later. I think to try the cold-pressed juice, which I’ve never tried. While asking about its benefits, I see buttered coffee (!) on the menu. It’s a style of coffee that’s taken Silicon Valley by storm. I’d been thinking something like this would be very hard to make on my own, so I decide to try it right here. This specialized coffee, said to help you lose weight and sharpen mental focus, creates a potentially habit-forming impression when it meets the palate. It goes perfectly with the matcha terrine, which is already a habit. Am I the only one to find the taste of Ginza in this melting sweet and mellow matcha, combined with smooth and bitter coffee? It’s truly a special place, somewhere you can spend a happy afternoon at the crossroads of childhood memories and fashionable first-class food, clothing, and articles for life.